The launch of the Razer Phone is something that we expected to happen for some time. We had started to hear rumors about this release for several months. But it has not been until a few weeks ago when the rumors became a reality. And this reality is the arrival of a smartphone that we loved. No doubt this Razer Phone is a device designed for leisure. To achieve that we enjoy all the digital entertainment options we need, it has powerful hardware. It stands out for having a 120Hz UltraMotion screen, two stereo front speakers with Dolby ATMOS technology, as well as a processor that achieves incredible performance and unparalleled speed. 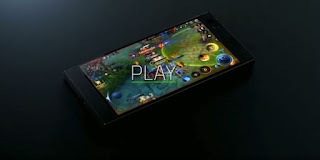 From Razer have wanted their first Android phone is a device that invites us to listen, watch and play without limit. 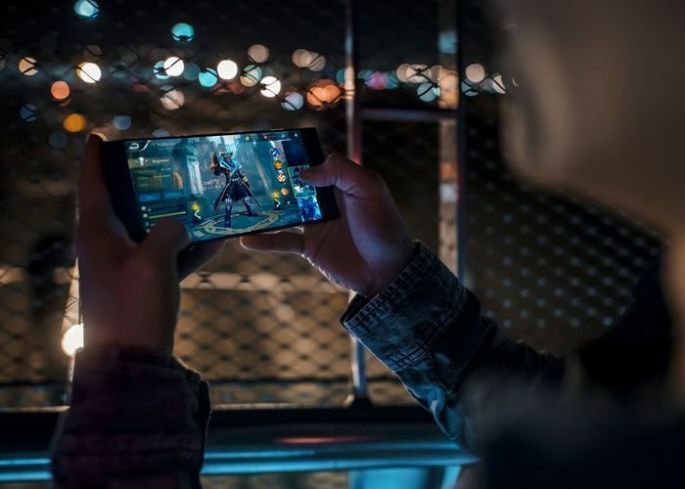 Although most of the smartphones that we find right now in the market have enough power to move any type of game, in Razer they wanted to take advantage of their experience in the gamer world to launch a mobile gamer and take it to another level. As we have indicated the American firm Razer presents its first Android mobile focused on a public Gamer . To achieve this, it has an amazing screen, audio with the quality of a movie theater and a battery with enough capacity to stay alive for a full day. In Razer have put all the meat in the barbecue to ensure that your phone can offer us the best possible experience. To achieve this, they have not neglected any of the most important aspects when dealing with a smartphone. It has a high quality screen. The best possible sound, some cameras that are not far behind and all the power that may need the best Android games on the market . Without a doubt the screen of a smartphone is the first thing that a user usually looks at. In this case the Razer Phone brings with it the world's first 120Hz UltraMotion screen . Thanks to the frequency with which it works, this screen offers the fastest image update rates and smoother graphics than any other smartphone on the market. The screen arrives with a size of 5.72 ". Which is an excellent size for us to enjoy our favorite video games. This screen has a Quad HD IGZO LCD panel that displays super vibrant and sharp images with a wide variety of colors. In a smartphone designed for digital entertainment, sound is something that could not be left aside. In this aspect, the Razer Phone provides us with the Dolby ATMOS technology, which includes audio that we have rarely been able to enjoy on a smartphone. We can enjoy this great sound through two speakers with amplifiers on the front. As in other smartphones, it does not have a 3.5 mm jack. So that we can enjoy the best sound anywhere and without bothering anyone arrives with a THX - certified USB-C audio adapter and a 24-bit digital audio converter (DAC) that will guarantee a sound with great quality when we use headphones or helmets. In a smartphone designed for us to enjoy video games the processor plays a very important role. The Razer Phone will guarantee the best experience thanks to its Qualcomm Snapdragon 835 processor and its 8GB of RAM. We recommend you use the Razer Game Booster app that helps maximize the power and performance when launching your video games. 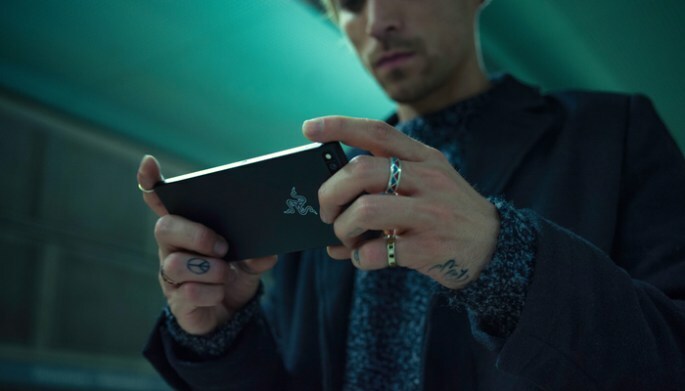 The battery of the Razer Phone has a capacity of 4000 mAh, a very interesting capacity and that will allow us to enjoy our games without fear of being thrown away. It also has a charger with Qualcomm Quick Charge 4.0+ technology that makes the recharge is quite fast. So gamers can enjoy their games all day long. In a device designed to play we might think that this would be an aspect to be set aside. But this does not happen on the Razer Phone. This equipment has two 12MP rear cameras. It offers photography fans a very versatile tool to make incredible photographs. Its zoom function is amazing, and the speed when focusing is quite good .. And thanks to the double flash we can be sure that people will always be captured in a clear and natural way. Physically, the Razer Phone is a beauty worthy of contemplation. It has a really nice design. In addition, its elegant 8mm thick aluminum body provides a good grip. It comes equipped with Android 7.0 Nougat and will get the update to Android 8.0 Oreo in the spring of 2018. As a user interface the Razer Phone comes with Nova Launcher Prime the integration of Google Assistant, which offers extreme customization of your Android for all tastes and preferences. In addition, the Razer Theme Store will allow its players to personalize their phones, change their wallpapers, get icons and color packages, and even enjoy different personalized ringtones by Razer DJs. According to the Co-founder and CEO of Razer, Min-Liang Tan, they have always been willing to manufacture a high-level mobile, and for years they have worked on it, for this the Razer Phone has managed to fulfill everything they have imagined, in all the aspects. Best of all, the Razer has made agreements with large "leading gaming companies", such as Tencent or Square Enix, in order to provide the best experiences and get the most out of features and power through your device. "The future of gaming will be on mobile devices, and both Razer and Tencent will be leading this trend in the near future," said Vincent Gao, Global Marketing Director for Tencent Games. Arena of Valor provides players with a great experience of fast games, and in Razer Phone it has been designed to handle the graphics, sounds and reflect the mechanics of the game thanks to its magnificent screen. This agreement sets the standards for the next generation in games with mobile devices. " In addition, Square Enix, the editor of the famous Final Fantasy series, has reached an agreement with Razer to improve the visual experience of the mobile version of Final Fantasy XV. When enjoying with a Razer Phone, players will enjoy the softest gameplay. Titanfall: Assault from NEXON Co., Ltd. and Particle City, Inc.
Now talk about the price of the Razer Phone and its availability in different markets. The Razer Phone will go on sale in all these countries on November 17, 2017. A large screen that offers sharp details and a smoother movement with vibrant and real colors. The sound is clear, we are facing a smartphone that sounds incredible. Offering quality both highs and lows of your favorite songs, either through the mobile speakers or your favorite headphones. Great performance thanks to a powerful processor and a battery to match. 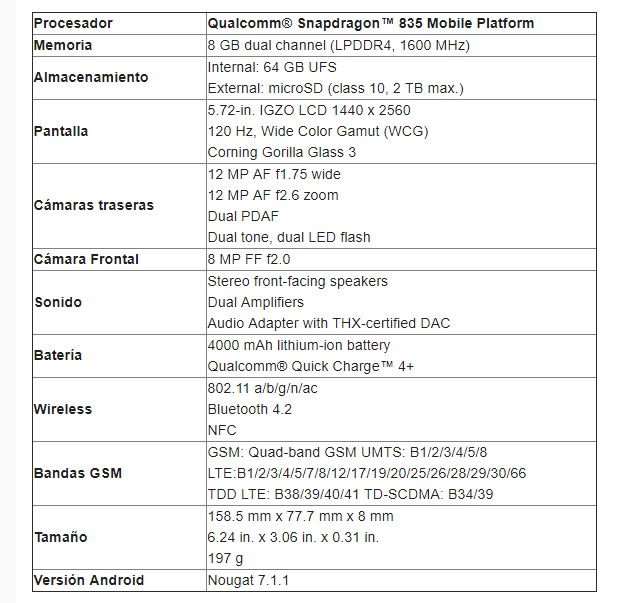 The price ... perhaps there are not many people willing to pay more than € 750 for a smartphone, but the quality has to be pasted and we have a quality smartphone.